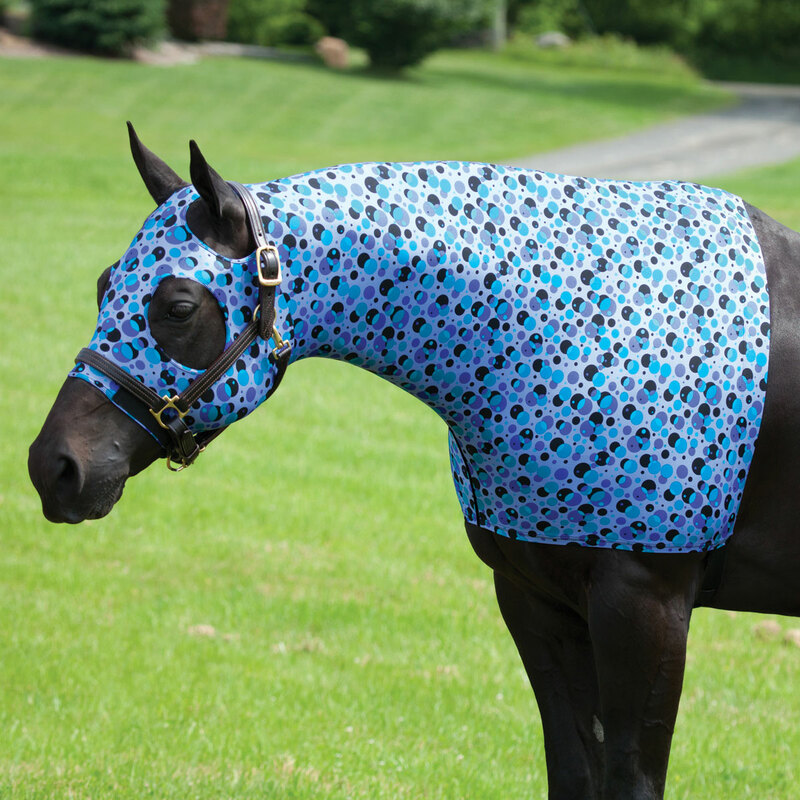 The Sleazy Sleepwear Stretch Hood with Zipper is the perfect protection for your horse! The Sleazy Sleepwear Stretch Hood with Zipper can aid in protecting braids and bands, keeping your horse clean, training a mane to lie flat or fall to one side, or serving as an extra layer under a heavier garment. The spandex hood incorporates the Seamless Face design to help eliminate any seams below the eyes for maximum safety and for the best fit possible without irritation. The zipper makes it easy to put on and off the horse. Machine wash warm on gentle cycle. Hang to dry. Indigo dyed, French terry hood with single button shawl placket front, gold denim stitching details and embroidered horns on left chest. Overdyed striped French terry pullover hoodie with rugby style placket front and pouch pocket. Tonal embroidered logo at left chest. Light weight, cotton/poly blend, French terry hood, Stardust heat transfer horns at front. Dual option drawcord. Sleazy Sleepwear Stretch Hood with Zipper is rated 4.1 out of 5 by 9. Rated 4 out of 5 by cjc75 from Great weight for Spring! Bought a month ago and have the matching tailbag - looks great on my horse. Rated 5 out of 5 by Lopinleroy from Love it! Fits great and looks stunning. Keeps my horse's bands shaving-free when he has a nap between classes on a hot day or overnight. The one I had in a different colour, same brand and size, lasted over 5 years before my horse finally damaged it. Rated 5 out of 5 by gypsy from Fun colors and works great! I bought this for my mare for keeping her mane nice as we shipped to a show. I love the colors and it worked very well to keep her mane from tangling. Rated 3 out of 5 by Karla from Looks and fits really good! Bought it and Loved the way it looked and fit. Works really well for what I needed for. My horse rubbed his main off and hair off on one side of his neck. Hair is growing back!!! Washes really good too! The only thing is it's not holding up too good. We have pipe for pins and I have had the product for two weeks. My horse has it all ripped up. Rated 5 out of 5 by Sheila from Excellent Love this Sleazy! Well made. Fits my mare perfectly. Rated 4 out of 5 by jwidliqh55 from Great item Use this for horse shows only, but love it, fit perfect and so cute!! Rated 1 out of 5 by TMaster from Ripped after one week Lasted for one week and by then had several rips in the fabric. Rated 5 out of 5 by Emma from Love it! I love these hoods. They last forever, and the color is really cute.